n+1 Issue 12: Conversion Experience est le grand livre que vous voulez. Ce beau livre est créé par n+1;Elizabeth Gumport;Lawrence Jackson;Helen DeWitt;Siddhartha Deb;Kent Russell;Carla Blumenkranz;Mark Greif;Alexander Borinsky;Yitzhak laor;Richard Beck;Kristin Dombek;Gideon Lewis-Kraus;Keith Gessen;Benjamin Kunkel;Marco Roth;Chad Harbach. En fait, le livre a 220 pages. The n+1 Issue 12: Conversion Experience est libéré par la fabrication de n+1 Foundation. Vous pouvez consulter en ligne avec n+1 Issue 12: Conversion Experience étape facile. Toutefois, si vous désirez garder pour ordinateur portable, vous pouvez n+1 Issue 12: Conversion Experience sauver maintenant. 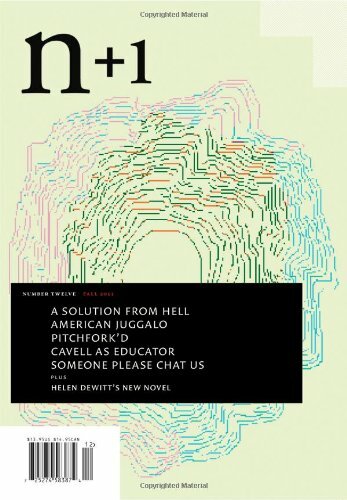 The definitive history of Pitchfork, a report from the Gathering of the Juggalos, Kristin Dombek (author of "The Two Cultures of Life" from Issue 10) on the surprising sweetness of The Book of Mormon, and an excerpt from Helen DeWitt's new novel, Lightning Rods. Plus Mark Greif on Stanley Cavell and Carla Blumenkranz on Gordon Lish and new fiction, poetry, and reviews.